When boring style dress shoe simply won't work for your wardrobe, these navy blue wingtip dress shoes feature a sleek wingtip look with that touch of Italian inspiration. Made of shiny navy blue leather with leather lining in a Medium width. 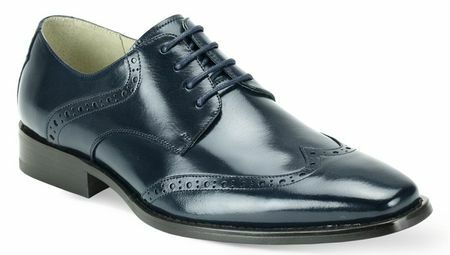 You will really set off that suit when you wear these navy blue wingtip dress shoes by Giovanni.